I can't seem to find any technical information about if the Psycho Gundam Mk-II has anti-beam coating or not. Any site I come across doesn't seem to provide information about this specific spec, so I don't know whether it has it or not, and I assume if doesn't have ABC then it was replaced by the reflector bits. So I'm basically wondering if the Mk-II has ABC like the original or not. Psycho Gundam has I-Field, not ABC. MythSearcher wrote: Psycho Gundam has I-Field, not ABC. It says on it's Mahq.net page that the MRX-009 Psyco Gundam has Anti-beam Coating. But the Pysco Gundam Mk-II has no mention of I-field generator. Well, though not an official source, Gundam Battle Universe on the PSP gives the Psyco Mk II an I-Field, as do the SD Gundam G Generation games, Spirits and Overworld. The SD Games normally have Anti-Beam Coating as an effect too so the fact it lists I-Field in those games makes me lean more towards it having one of those over an Anti-Beam coating, since those games are usually pretty accurate. Though thinking about it, the I-field might be an analog to the Reflector Bits, and instead of adding a new effect name they just slapped the I-field effect because of the bits. Xenosynth wrote: Well, though not an official source, Gundam Battle Universe on the PSP gives the Psyco Mk II an I-Field, as do the SD Gundam G Generation games, Spirits and Overworld. The SD Games normally have Anti-Beam Coating as an effect too so the fact it lists I-Field in those games makes me lean more towards it having one of those over an Anti-Beam coating, since those games are usually pretty accurate. The armaments given in the games is the reason I asked this question, because in Gihren's Greed: Threat of Axis V both Psyco Gundam's have I-Field Generator's, which I thought was a replacement for their anti-beam coating and reflector bits respectively (although the Psycho Gundam Mk-II in MA mode has reflectors), however other mobile suits that also have anti-beam coating like the Hyaku Shiki don't have I-Fields to replace their anti-beam coating, and thus the reason I thought that the Psyco Gundam Mk-II might have anti-beam coating. I see no I-Field mentioning in the GFF pages there. Well, that's the thing that's a bit odd Baund, because the SD Gundam games HAVE anti-beam coating as a support effect but instead gave it an I-field. Giving it an i-field over an Anti-beam coating would be weird because that's like replacing a 9mm automatic weapon with a MIRV. It seems a lot of games give it an I-field but as far as I've been seeing, I see no official mentions of it. The Encyclopaedia of Gundam Ver. 1.5 states clearly that the Psycho Gundam has I-Field, but also did not state anything about the Mk-II. I checked other sources as well, older sources never mention anything on both, and newer sources states I-Field on Psycho, including the HGUC manual, which states it got a Beam Barrier and I-Field in blankets but none stated anything about the Mk-II. I don't seem to come by any official sources that states ABC though. From what I could make out on the Japanese wiki it also states it has an I-Field, so I'm sorry for doubting you on this. Also does your encyclopedia mention how many it has? I understand the doubt. Not all sources mention that MK2 have i-field. In fact, som old games does not give MK2 i-field (namely the great old G.Gen F). I think the i-field on MK2 maybe a retcon, although I think that makes more sense. The ABC on MK2 is a confirmed info, so did the reflector bits. Nope, those only stated it has I-Field generator, none stated about how many. Enileph wrote: I understand the doubt. Not all sources mention that MK2 have i-field. In fact, som old games does not give MK2 i-field (namely the great old G.Gen F). I think the i-field on MK2 maybe a retcon, although I think that makes more sense. Well, none of the sources I came by talk about I-Field on the Psycho Mk-II, it does pop up some times in games, and I can understand that because in the show, Mk-II block beams pretty much like the first, with pretty much the same visual presentations. The I-Field on the First is also a retcon, the earlier sources state nothing about it. Earlier sources also give a lot of other names for I-Field, like Beam Barrier, Beam deflecting Field, etc. The EB series uses the term Beam deflecting field for the Psycho Gundam and states the Reflector Bits as an advance in technology, so the Mk-II might really use the reflector bits as its I-Field instead of having a separate system. MythSearcher wrote: The EB series uses the term Beam deflecting field for the Psycho Gundam and states the Reflector Bits as an advance in technology, so the Mk-II might really use the reflector bits as its I-Field instead of having a separate system. Also, mobile armors had a strong experimental element, and various technological innovations were attempted with them. The MRX-009 Psyco Gundam and MRX-010 Psyco Gundam Mark II were machines that more or less realized the technologies that were repeatedly researched by the former Principality forces. Among these were beam-deflecting field generators that formed anti-beam barriers, Minovsky craft systems that countered gravity, and large diffuse mega particle cannons connected directly to the generator. Their mobile armor forms were mobile fortresses, whose offensive power rivaled that of a cruiser. -mentions a communication(?) field generator on the back of the head that has a range of 40m. Is this what Four uses to summon the MA from outside the cockpit? -mentions a Weapon Bay on each arm armor, no further details. Not to be confused with the forearm's Power Generators for the finger beam cannons. -mentions missile attack on the MA form paragraph, needs translations on this one! -mentions a Programing System located on the Head Cover Armor of the MA mode. -nothing too interesting, besides the Beam Swords being based on the Zeong system. That's also what confused me the first time it appeared, when the Mk-II fired it's beam rifle on the first Psyco it appeared as though it was bouncing off, rather then deflecting it (like Big Zam did with it's I-Field). Then again like you said it's a retcon and the subs also say it has "Beam Barrier". So could that mean the "anti-beam barrier" listed for the Rafflesia in F91 and the unused Ebiru Doga could be the same types of fields? Though, I do wonder why they'd have Reflector Bits to redirect beam fire from the main body rather than just using normal Bits that can fire their own beams from different directions. My only guess is that it can help save on cost and energy consumption given you'd be able to fire shots from the main body yet have them continuously "fire" themselves with the Reflector Bits rather than keep firing entirely separate weapons. Yeah, funnels are pretty limited - they run off rechargeable E-CAPs that only allow a limited number of shots. Bits are normally bigger, with on-board generators, but they're consequently easier to hit. I imagine, if you have a huge Psyco Gundam with a ton of powerful built-in cannons, it makes sense to just redirect their beams with small reflector drones. Funny story - because we were working on the Gundam UC subtitles well before the animation was finalized, so we could do a simultaneous all-region release, I don't actually have the final versions of the episodes. (They send me Blu-Ray discs after they're released, but I don't have a Blu-Ray player.) I can usually resolve any visual confusion by checking the scene descriptions in the original script, but it's been a while since I worked on episode 4, and when I look at the check video now I can barely figure out what's going on in the mecha battles. For what it's worth, the writeup on the Shamblo in those IDTC columns (and the Prismatic Mobiles book which collects them) indicates that the reflector bits serve both functions - they redirect the Shamblo's own beams, "widening the angle of its diffuse mega particle cannons", and the multiple bits also collectively form a protective beam barrier. That latter function actually sounds a lot like the Nu Gundam's fin funnels, or the planet defensors in Gundam Wing. If the reflector bits double as a beam barrier, then maybe they do render a traditional I-field barrier redundant. I'll keep an eye on this when I get to episode 36 in my ZZ subtitle-checking. Because the earliest mega particle cannons were quite large and used a great deal of electrical power, they were set in large turrets. It was difficult to improve the targeting accuracy of these large turrets, and their ability to track moving enemies was none too high. Therefore, in more advanced types of mega particle cannon an I-field generator was installed in front of the focused particle emitter, making it possible to deflect the beam by about 20 degrees. 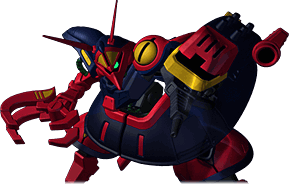 In Gundam Century, most mega particle cannons which are set in deep sockets - the Gogg's belly guns, the Zanzibar's bow cannons, the main guns of the Bigro and Big Zam, the mouth and waist guns of the Zeong - are described as deflection types. Entertainment Bible 1 adds the Zock to that list, and says that the Big Zam's smaller anti-air cannons are of the same type. Baund Doc wrote: That's also what confused me the first time it appeared, when the Mk-II fired it's beam rifle on the first Psyco it appeared as though it was bouncing off, rather then deflecting it (like Big Zam did with it's I-Field). Then again like you said it's a retcon and the subs also say it has "Beam Barrier". Big Zam did pretty much everything barriers can do to a beam. It deflected some, reflected some, annihilated some, defused some. So some bounced off, some reflected to different directions, some just plain disappeared and some spread into smaller beams and spread out.